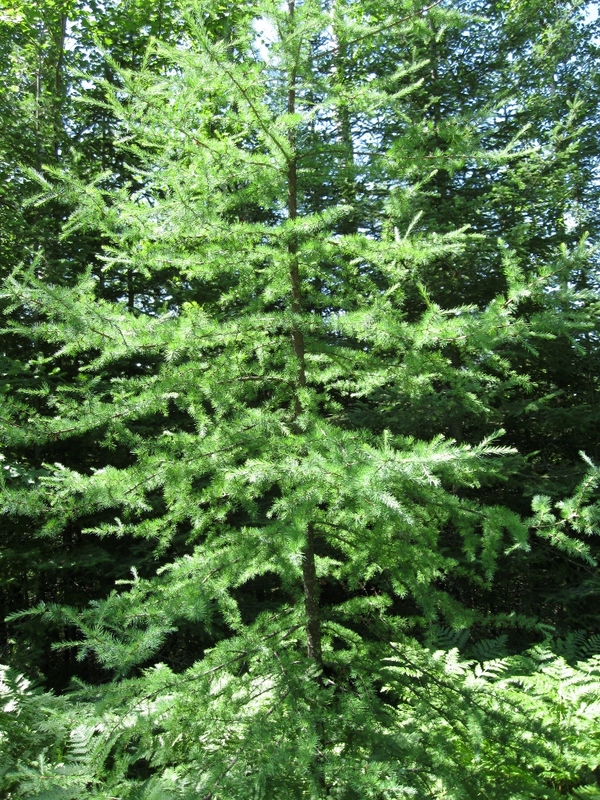 Jack, who always leaves such lovely comments, asked about tamarack, and I took a couple photos of tamarack a while ago that have been sitting on my hard drive, so the topic of my next post is obvious. 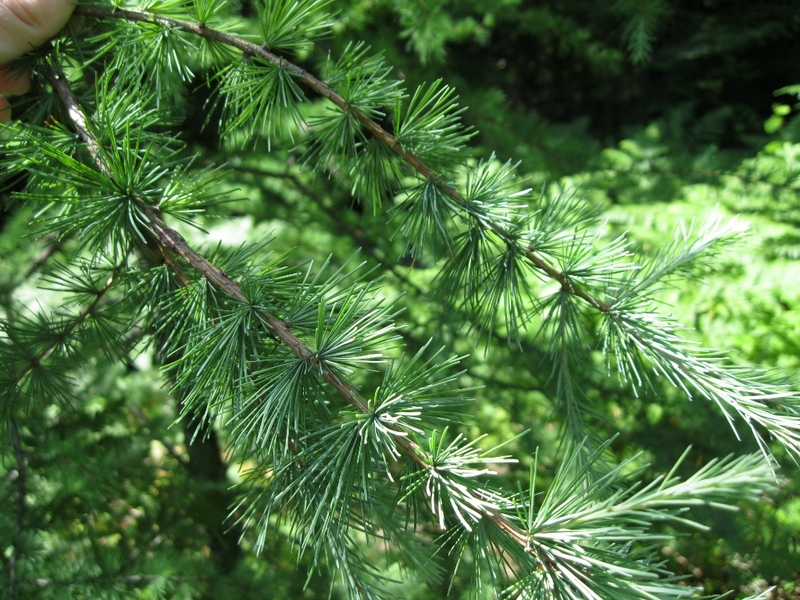 Larix laricina, commonly known as tamarack, American larch, or hackmatack. (Gesundheit on that last one.) Where I am now in northern Wisconsin seems to be a sort of transition zone between the harsh boreal forests to the north and the more diverse forests to the south, with boreal species like tamarack, spruce and aspen found side-by-side with maple, oak, birch and basswood. Some species I was familiar with in Ohio, like sycamores, are missing entirely, and some, including most of the conifers, are new to me. Tamarack ranges north to the very limits of the tree line. Its needles, which grow in tuft-like bunches, are incredibly soft to the touch. During a portage on my canoe trip over the weekend, I leaned back to let someone pass me on the trail, and when I felt something silky brush my arm I didn’t have to turn around to know the tree behind me was a tamarack. What’s even more interesting is that this is a deciduous conifer. These needles will turn gold in the autumn and then fall. 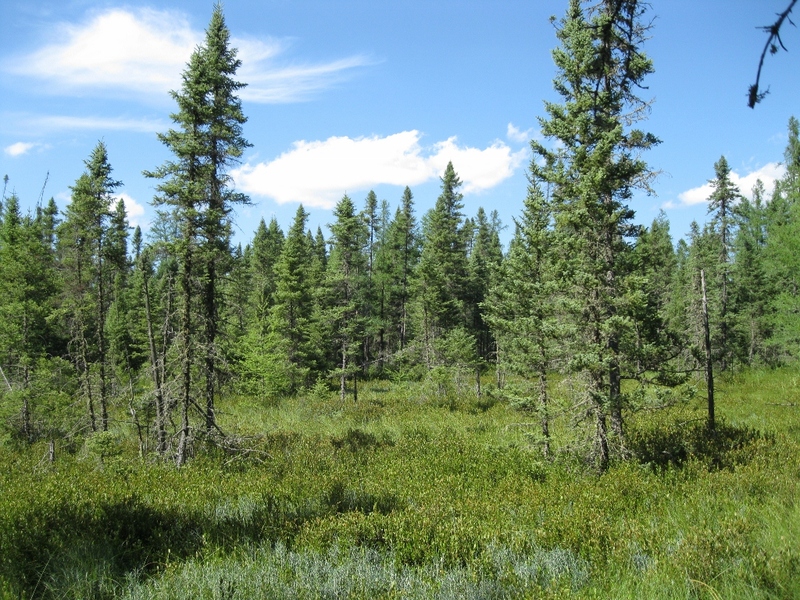 When old lakes fill in and turn into bogs, like the one above, moisture-loving tamaracks will be one of the pioneering tree species (along with spruce). Although I can’t rationally explain why, I have a lot of fondness for these slightly oddball trees. Come autumn I’ll have to take some photos to show you the color change. Sadly I don’t do a lot of pleasure reading any more except when I’m traveling or otherwise on a break from work and school, but I’ll keep the reccomendation in mind – thanks! I wonder if the tree he mentions is a different, related species. I’m pretty sure this particular one is endemic to North America. Don’t know your schedule at all…but when I was in grad school, I let myself read for about 30 minutes every night in bed before turning out the light. I missed reading something for myself, and I was surprised how much I could get through in a week! However, I also did that because I was pretty stressed and it was a good way to re-set my brain from the day’s struggles. But if you’re out canoeing and tamarack-ing all day, that may not be an issue for you! Interesting pics and a great description!!! Thanks. I was wondering where you posting from…the photos have reminded me so much of northern Ontario. Love the tamarack trees and your other photos of adventures in northern Wisconsin. Yup, after nine months in Georgia and some travelling around in between, this is home for the next two years. I’ve never been to northern Ontario but it must be gorgeous.